The Bull in Ditchling is lovely. One of those pubs that smells of old wood but has moved with the times to satisfy modern rural pub goers. It's a good example of a historic pub that has had a sympathetic facelift, with modern touches compementing the old. Somewhere that would appeal to all ages. Comfortable with a hint of luxury about it, y'know? It's a tricky one to get right, and so many get it wrong, but the Bull storms it*. And everyone agrees because when we arrived at midday on Sunday for a roast, it was already rather busy. 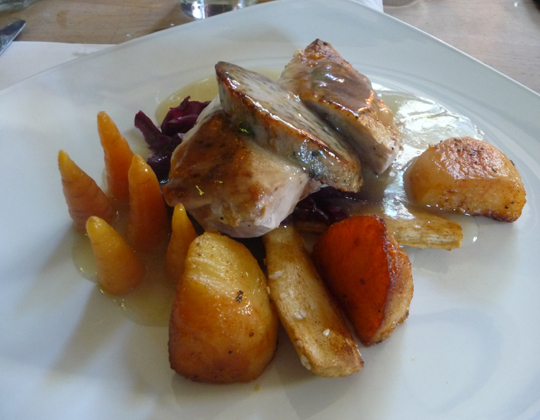 Seeing as you can't book for Sunday lunch, it's really worth getting there on the early side to secure a good spot. Staff don't seem to be hell bent on turning tables (thankfully) so you may have to endure a bit of a wait. There is talk of extending the pub into an adjoining building which would help but for now I'm sure you could find something to do in the bar area! Anyway, I'm not one for starters before roasts so we launched straight into the main event. My chicken supreme was soft, soft, soooooooft. So good I stupidly let Baby Foodie try it and he pestered me until I gave him over half of it. Critter. The 5 baby carrots, all stood up, were sweet touch, although some would argue contrived, but I think the concept here is to offer something a little different or an element of surprise as the powers that be here are clearly keen on details. Cabbage was nicely acidically spiked and the firm slice of stuffing aromatic. The only thing I would say, which was a shame, was the plate was cold so the gravy, having been made properly with the fats, congealed unappealingly on the side but thankfully didn't ruin the dish. 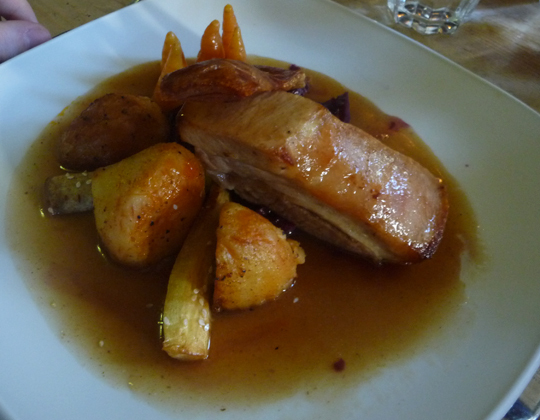 Around the table, as per mine, the beef (two nice thick slices) and the pork belly went down a treat. The belly could have been cooked a touch longer as that would have help render the fat down further and made the meat more tender but it was a thick ol' slab of it. Those wanting that borderline grotesque pile up of a pub Sunday lunch may be disappointed but I think portions and vegetable variety were spot on (and as you know I'm greedy), and what you got was good quality which I'd take over the former any day. Best bit is that it left room for desserts and room they should be given. Personally, I only got as far as the first option on the menu as it was written for me. 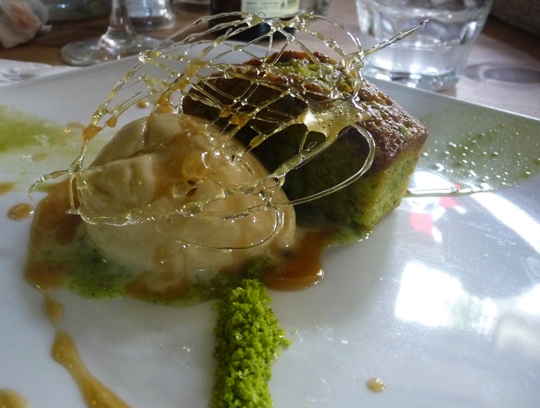 Pistachio and Olive Oil cake with Salted Caramel Ice Cream. They must have known I was coming. The vivid green line of crunchy pistachio crumbs, soft, crubly cake and sticky caramel sauce were a fantastic combination of textures and really beautiful flavours. Seriously, I could have given a Sunday sermon on it. I really don't like overly sweet desserts, certainly not after a roast, and this was one gorgeous grown up treat. And how pretty is the Rubabrb and Apple Pie (top picture)? 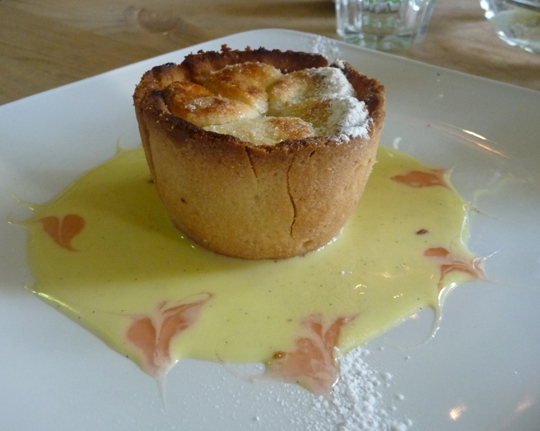 Tasted lovely too, great hit of just-right sharpness from the rubabrb toned town with the Calvados Creme Anglaise. I'd think that the cheeseboard would be worth a try, although only featuring only one local on there (Sussex Charmer). But seeing as I've now tried most of our (fantastic) local cheeses, the Burwash Rose (washed in rose water), Afterburn Cheddar (exactly what you are thinking) and the Flower Rose Sheep's cheese (love, love sheep's milk cheese) would be a nice taste journey around the UK. Maybe next time. 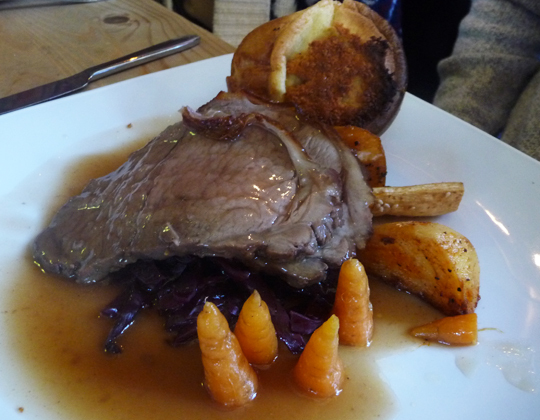 Roasts were priced around the £12-13 mark which is pretty good value for the quality and in comparison to others in the area. Staff were great. Friendly, professional, smart. None of that teenage weekend staff malarky. Baby Foodie was welcomed and they have those nice Stokke HandySitt booster chairs so he could sit right up to the table. There's a children's menu available with decent, proper food options for them too. As Sunday roasts tend to be more of a laid back affair for proper "gastro-pubs" this has left me really wanting to try out more off the standard weekday menu at the Bull. If you want to get out of Brighton but don't want to travel far, the Bull is a stellar option. *Apart from the scary frosted glass loo cubicles becasue i was wearing a particularly high-contrast outfit and noone like peeing with an unesy feeling, hear me?